Fairtrade is an international trade movement that focuses on providing better trading conditions for poorer producers in developing countries, protecting them from volatile markets. Many farmers in developing nations are unfairly paid for their produce due to fluctuating crop prices. Fairtrade helps by guaranteeing farmers a minimum fixed rate for their goods, providing them and their workers with a decent wage and improving working/living conditions. The scheme also pays an extra premium for investment in local community projects, such as providing clean drinking water, better healthcare, sanitation, education and housing. If the world market price rises above the Fairtrade minimum, farmers with a fair trade agreement must receive the higher price for the produce, in addition to the agreed Fairtrade premium. The Fairtrade mark is an internationally recognised labelling system that certifies products sourced from producers in developing countries as Fairtrade. In order for a product to display the Fairtrade logo it must meet international Fairtrade standards which are set by the international certification body Fairtrade Labelling Organisations International (FLO). FLO regularly inspects and certifies more than 580 producer organisations in 59 developing countries in Africa, Asia and Latin America. The independent, non-profit organisation was launched in Germany in 1997 to unite the Fairtrade labelling initiatives and establish worldwide standards and certification. In Britain the Fairtrade Foundation – a member of FLO – is responsible for raising awareness of Fairtrade and licensing the Fairtrade mark to products. The Foundation was set up in 1992 by a group of charities and aid organisations, and has helped make the UK one of the largest Fairtrade markets in the world, supporting millions of growers and producers in third world countries. Fairtrade products, or foods that carry the Fairtrade mark, are products that have been regulated and certified by Fairtrade Labelling Organisations International (FLO). Fairtrade began with commodity products such as coffee and cocoa, slowly rising to 150 products by 2003. There are now over 3,000 Fairtrade certified products available in many of Britain’s major supermarkets and independent retailers. There are also more than 30 wholesalers who sell Fairtrade certified products to the retail market . The amount of money spent on Fairtrade products by British consumers has risen sharply over the past few years. In 2008, sales of Fairtrade-certified products reached an estimated value of more than £700 million, representing a rise of 43 per cent on the previous year. The impressive performance was achieved despite retailers and consumers suffering from the global economic downturn. Analysts believe Fairtrade goods have remained popular during the downturn because of the wide range of products available, and the price of these goods. Fairtrade foods are no longer associated with higher costs as most supermarkets now sell a large amount of Fairtrade food and drink as part of their own-brand (cheaper) produce. The Co-op – The Co-operative Group is one of the biggest supporters of Fairtrade. Co-op supermarkets have stocked Fairtrade products since 1994 and their entire range of coffee, tea, chocolate and bananas carries the Fairtrade mark. Tesco – Tesco offers one of the most comprehensive Fairtrade ranges in the UK, currently stocking around 130 Fairtrade lines, of which 30 are Tesco own-label products. These include own-brand mangoes, avocados, citrus fruit, cookies and honey. Tesco was also the first UK retailer to offer Fairtrade basmati rice, brazil nuts, and mixed peanuts and raisins. Asda – Asda currently stock more than 100 different Fairtrade products and works closely with the Fairtrade Foundation to promote their licensed products, along with a number of Fairtrade partners. Sainsbury’s – Sainsbury’s promotes itself as the biggest UK retailer of Fairtrade products. 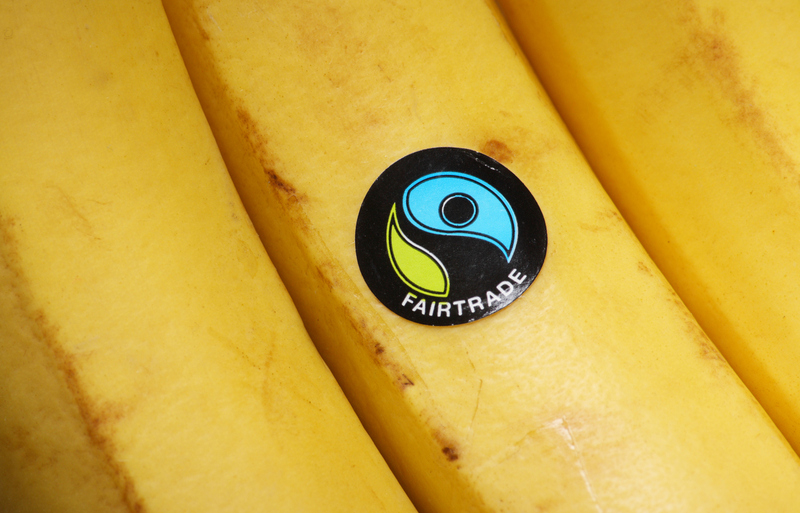 All its bananas, sugar and own-label teas are Fairtrade. The retailer also sells Fairtrade coffee, chocolate, rice and wine. Morrisons – Morrisons were among the first major supermarkets to sell Fairtrade products. Their Fairtrade range currently consists of both Fairtrade branded and Morrisons own-brand products, including hot beverages, jams, juice, fresh fruit and vegetables, snacks and sweets. The supermarket also sells Fairtrade coffee and tea in all of its 321 store cafes. Waitrose – Waitrose’s Fairtrade range include coffee, tea, sugar, spices, marmalades, wines, ice creams, cereals, baby foods, mangoes, pineapples, avocados and fruit juices. The John Lewis-owned retailer also offers Fairtrade roses from Kenya. Marks & Spencer – M&S sell Fairtrade wine, tea and coffee, while the coffee in its Café Revive coffee bars is also Fairtrade. Aldi & Lidl – These increasingly popular discount supermarkets also stock several Fairtrade products including coffee, tea and sugar. Fairtrade foods and organic foods are both part of the international movement towards environmental sustainability. However, a common mistake that many consumers commonly make is assuming that they are the same. Although they both offer significant benefits, the main difference between the two is that Fairtrade food is produced primarily with the welfare of farmers in developing nations, rather than the consumer and the environment (although organic farming does help protect farmers from exposure to toxic chemicals such as pesticides). However, there are foods produced that meet the standards of both organic and Fairtrade and are therefore considered Fairtrade organic foods. Fairtrade organic foods currently available on the market include organic fair trade coffee and organic fair trade chocolate.